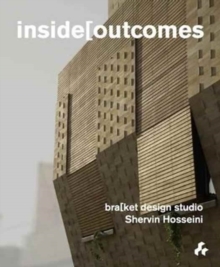 Inside[Outcomes is the story of the award-winning Bracket Design Studio, a Tehran-based full-service design firm. Founded by Shervin Hosseini in 2006, Bracket Design Studio is a leading voice within a constellation of young Iranian architects and designers just beginning to emerge on contemporary architecture's global frontier. This publication frames Bracket Design Studio in the context of both recent developments within Iranian architecture as well as its deep-rooted history and tradition. It considers the socio-political shifts within Iranian society beginning in the early 2000s that characterise the emergence of what is largely seen as a new wave of built culture. Fearlessly integrating marble, concrete and wood, recent projects like the Jannat House, Siavash House and Villa 113 weave together sacred geometries and contemporary facades, fusing inherited materials and techniques with unprecedented design that is revolutionary not just in Tehran but on a global scale. An in-depth look at a cross-section of Bracket Design Studio's projects, both built and unrealised, unfolds alongside exploratory essays on the practice, written by some of Iran's premiere architects and cultural historians. These reflections offer key insights into the group's unique studio culture as well as the collaborative and cross-disciplinary approach to design that defines each project. At the heart of the practice are the unique needs of each client coupled with an overarching dedication to the possibilities of the site and what it demands from the structure, particularly in Tehran where urban life is hot, crowded and dust-filled. This publication unpacks the first ten years of Brack Design Studio's work in Iran, and illuminates future projects alongside its growing international profile.